Thai black sticky rice is one of the greatest contributions of Thailand to entire mankind--this dessert is so delicious you'll never have enough. A rare rice that we don't often promote because in truth we usually only have a few cases on hand, and if supply gets tight price can go very high. 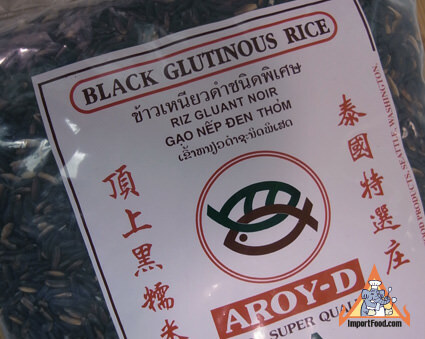 Good black sweet rice is often sold for $6 or $8 per lb, and here we have the very best 'Aroy-D' brand in a generous 5 lb bag for a great price. Prepare black sticky rice in the same as white sticky rice (see recipe below). You can cook it as 100% black sticky rice, or feel free to mix 50% (more or less) with white sticky rice and steam together. The result is a nice consistent purple color, with an earthy flavor. You get one 5 lb bag, Aroy-D brand as shown. Product of Thailand. We were visiting Bangkok recently and attended a Thai rice exposition, organized on behalf of the King of Thailand, in one of the large convention halls. Here we learned about the process of cultivating rice, various ways to cook rice, and how to distinguish the different varieties of rice grown in Thailand. Of course there was a lot of cooking going on, and one older lady was making a splendid dessert that combined both black sticky rice and white sticky rice. Cooked together it created an unforgettably smooth, and slightly crunchy texture, and the taste was just plain "out of this world". We got the recipe for that, then decided to prepare it at home with fresh raspberries, strawberries, and white chocolate. This is a heavenly combination of flavors, and we really hope you'll try it.